Love them or hate them, family road trips with kids are a summer rite of passage. I grew up taking road trips regularly and do so now with our children, the little Frugal Rules’. In fact, one of my favorite road trips is a near 3,500 round trip vacation we take every few years to drive from Omaha to visit my in-laws in San Diego. 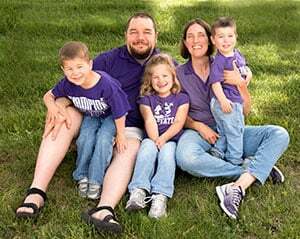 Yes, there are cries of “How long ‘til we get there?” but it is also a blast to have that quality time together as a family. Summer road trips can be fun, but some are afraid to take them because they assume road trips are expensive. They don’t have to be. Family road trips can be quite frugal if you plan ahead. 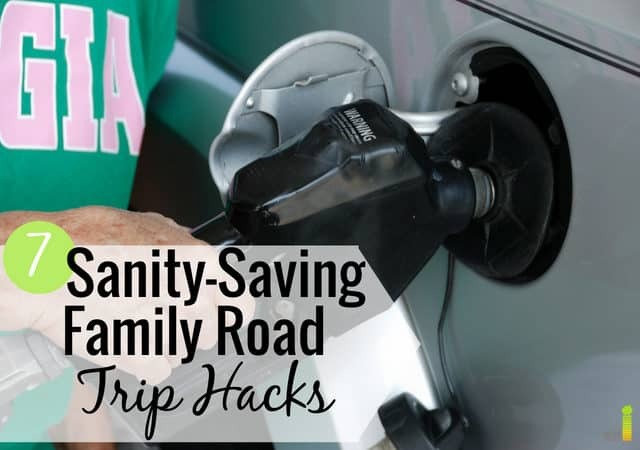 If you’re up for taking to the road this summer, try out some of my favorite tips to save money on family road trips with kids. Where will you stop for gas? Will you be going through areas that don’t have gas stations? What kind of gas mileage are you getting? What hotels will you stay in? There are a variety of other things to consider, but planning out your road trip helps you save money. Make sure to take advantage of money saving websites to help reduce your travel-related costs. You can use Expedia, for example, to save money on lodging costs, among other things. Are the tires properly inflated? Do you have a full tank of gas? You want to make sure everything is working right with your car, and if in doubt, don’t write off renting a car. Yes, it adds cost, but it mitigates the wear and tear on your car. There are many ways to save money on renting a car, but we use one of our favorite Costco hacks and rent through Costco Travel. You get to compare up to four locations at once and can typically save more than renting directly through a specific provider. Bringing your own food along is a tried and true road trip tip. Meals can get expensive – you can easily spend over $25 for a family to eat lunch at a fast food restaurant. Not only is that not very healthy, but it also adds up quickly. To counter this, make sure you take plenty of snacks, water, and lunch. We’ll even take a small cooler and throw some sandwich meat in there so we can make lunches on the way to save even more money. Here are some coolers from Amazon you can buy to do the same thing and save money. Packing breakfast, lunch, and snack foods means you only have to buy dinner each night (at most) and lowers the overall cost of your road trip. If you do need to stop for food, make sure to use the Ibotta app to save money when buying food items at the store. Ibotta has deals on both generic and name brand items and can be a great way to get cash back on your shopping. Summer road trips with kids mean one thing – keeping them entertained. This is where road trip games come into play. These help the time go by faster for the kids, but it also can keep you awake at the wheel. We’ve tried the Chat Pack for Kids card game with our kids and they love it. When we drive to San Diego, my wife likes to take surprise sacks on the road trip. We include things like healthy snacks, short books, trinkets, and a few treats in each sack. Every 75 – 100 miles the kids get to pick something out of their sack. They absolutely love it and it helps time pass by that much faster for them. We have also bought the Snack and Play Travel Tray from Amazon for our youngest, when he was in a car seat. It attaches to the car seat and allows the child to have a tray to play on or eat from. It was a great investment and made each trip more enjoyable for him. At the end of the day, the entertainment aspect makes it that much easier to avoid buying crap stuff you don’t need while on the road. 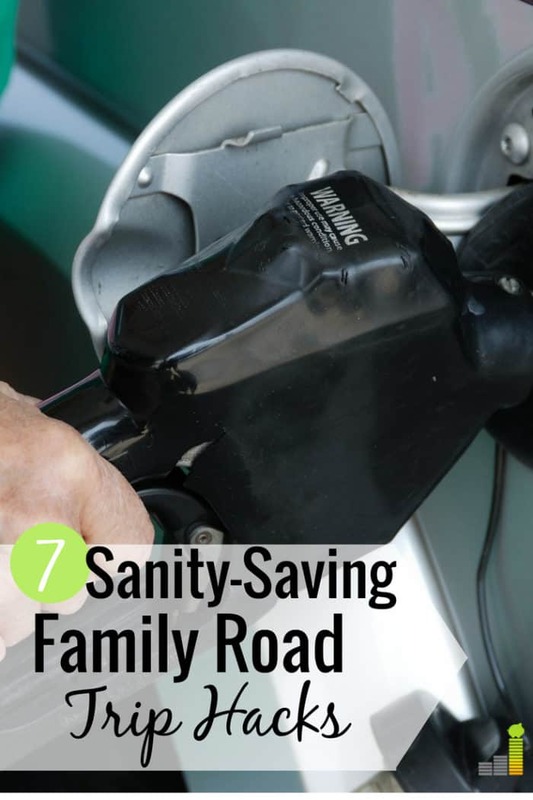 Saving money on family road trips comes down to one thing – knowing what you have to spend. As with anything, we budget what we have by setting a per day budget whenever we go on a family road trip. Not only does this help you know what you’re working with each day but it also makes you question if you really want that souvenir. If you know you’ll be traveling later in the year it might make sense to put money in a savings account strictly for the trip(s). CIT Bank is a great option as they pay 1.55 percent (currently 22x the national average) and have just a $100 minimum balance. 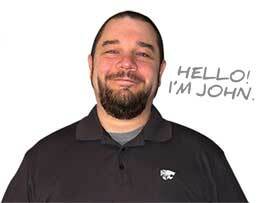 You can earn even more with their money market account that pays 1.85 percent. Depending on the length of your road trip, you may need to stay somewhere a night or two while on your trek. Hotels, especially in some cities, can be very expensive. There are other options to consider. You can save money through renting a house or condo through VRBO. We regularly do this and always save a significant amount of money. If your family enjoys spending time outdoors or in nature, you can also look at camping as a means to save money. If a hotel is your only real option, then look for ones that offer breakfast as a way to save money. Family vacations mean often making stops. Not only do they add time to the trip, but they can also add cost as you’re allowing yourself more opportunity to shop. Limiting stops may be more difficult when taking road trips with kids, but it can be done. Make your stops count. Instead of making a bunch of shorter stops, consider reducing them and taking fewer, longer stops. Combine different things like getting gas, going to the grocery store for snacks and bathroom breaks all together and you’ll shave time and cost off your trip. Family road trips can be fun. Yes, they can be a little nutty, but that’s half the fun of it. It’s good to know that you can have fun without spending a ton of money. With some simple planning and discipline, you can make the road trip cost effective and one to remember. What do you like to do on road trips? What is the longest road trip you’ve ever taken? How do you save money on road trips? We go on road trips all the time. I have a really good system! I like driving vs. flying to certain destinations because it is cheaper and not such a big hassle. We’re the same way Holly. In some instances it just makes more sense to drive. We eat healthy most of the time, and rarely watch tv. The kids know that when we go on a road trip, they get to watch movies on the iPad and have treats they normally wouldn’t get. M&M’s and Cheetos go a long way with a kid who never gets to eat them. Another great way to entertain on the cheap is a brand new coloring book and a new box of crayons or markers. We’ve done the new coloring book idea many times – it’s always a hit. My wife and I haven’t gone on a road trip but we’d like to someday. Right now with both of us in grad school and working full-time we would rather fly somewhere and get there ASAP so we can extract full value from PTO days. It’s interesting you said not to stay in a hotel. I would think on a road trip you’d have the ability to plan well in advance so you can lock in a cheap rate? I mean, you could search such a wide geographic area that I would imagine there would be some very affordable options and you can adjust your trip accordingly? Just a thought. Completely understood DC – it makes sense to fly given that being the case. You can plan out, however in some instances you just can’t find a reasonable rate so it’s important to keep your options open. Love all of these tips! We have taken several road trips lately. We spent around 60-70 hours on the road in May, 40 hours in June, and probably another 80 in July. Lots of traveling this summer! Wow, sounds like a lot of traveling! Our cooler is a life / wallet saver. We had it for 10 years and it’s doing a great job. Instead of paying top dollar for refreshments from gas stations, we just bring our own stuff. Same with sandwiches, fruits, sweets etc. This can save A LOT of money. It does need a bit of a preparation, but it’s clearly worth it. We do a lot of the same thing – I have a small cooler my Dad used 30 years ago and it still works great. Food is something we can prepare. So whenever we have road trips, we prepare and plan for food that we’re having just to stay away from eating out or at fast food and to save money that we can use in other activities during the road trip. Yep, it’s definitely a good way to save some extra money. When I was younger, I would sometimes sleep in my car on road trips to save money. This is harder to do with a family on board- we are going to try camping this year. I’ve never been on a road trip until I got married. Now we do them all the time. We find the best price for a rental (Costco Travel has been a wallet saver! ), plan out the cost of gas, hit up our local Aldi’s and pack the cooler! It’s been a blast taking the backroads and discovering fun landmarks.